Today was always going to be the day when we had a decent shot at the Monsoon's other deadly weapon namely the Haboob. Storms were expected to fire in the SW Of Arizona and the SPC Duly slapped a See Text risk down there and then promptly took it down and moved it 200 miles further west over Baja in California. We stuck to our guns anyway and went south from Gila Bend towards Aja which once again is over Border Patrol and into Mexican and Indian Lands. After going east from Aja we came across rapid storm development just 3 miles to our south, this storm was gaining much more intensity than we had seen on this trip with storm tops to 55k feet. A mini Haboob formed with this initial storm but my attention was now drawn to an Outflow Boundary to our North which was heading towards Gila Bend and Casa Grande and arcing to the North West. Along the way another Monsoon storm popped up along the road and whilst clipping this storm along it's western flank we witnessed an incredible Dust Devil / Gustnado which took on the appearance of a Wedge Tornado, it was an amazing sight. We then retraced our steps North back through Aja and towards Gila Bend, the optimum time (Sunset) was rapidly approaching so we stopped 10 miles to the North West of the storm cluster which was moving towards us. The Lightning frequency was still not upto much with 1 Cg bolt every 2-3 minutes but the guys got some nice shots, I failed massively at this point. The Storm by now was moving due west and still had a decent intensity to it, so I repositioned us further west along I-8 And found a really nice stopping point near some railway tracks looking south head on into the approaching storm, the tell tale signs of a Northward racing Haboob was lit up by the lightning, this was a first for me (Night Time Haboob) and was a great ending to an astounding monsoon chase day. Storm Cluster to our East moving West towards us with Rainbow from Storm near us. 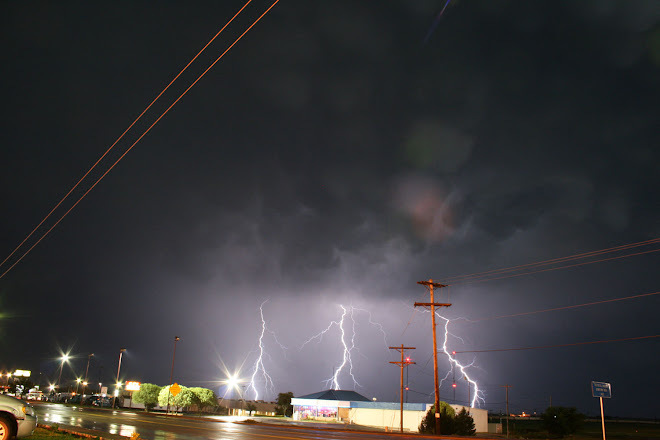 Picture above is of the Night Time Haboob Approaching with Cg Strike behind Rail Tracks.